Home Pregnancy Tests Pregnancy Test FAQs Signs Of Pregnancy But Negative Pregnancy Test? So you’re in a situation in which there signs of pregnancy but a negative pregnancy test? Should you call the doctor or wait for another day to take another test? It’s disconcerting to get a negative pregnancy test when your body is screaming pregnancy! Panicking in such a scenario is obvious. Feeling insecure about your fertility is as dreadful. For someone who has been trying to conceive getting a negative result, a woman is devastating. Adding to her misery are the mood swings, nausea, and cramps as pregnancy signs. If you see pregnancy symptoms but negative pregnancy tests, don’t rule out the possibility of being pregnant. There is a possibility that your pregnancy could be proceeding a little gradually. Pregnancy tests are only qualitative, and they detect the hCG hormone present in urine. If the pregnancy test is not sensitive enough it will not detect traces of hCG present in your body. Early pregnancy tests can detect pregnancy earlier than normal pregnancy tests. After you continue getting negative pregnancy test you keep checking whether your period started. The next problem is big if you have missed the period and get a negative pregnancy test as missing of the period by a week is a sign most women take as pregnancy. I had a negative pregnancy test but still feel pregnant, why? There are many reasons for missing or late period and negative pregnancy test. But when you see pregnancy symptoms, you disregard all other possibilities. All you want to believe is that you are pregnant. The mind sees as you decide. Even a regular stomach ache starts feeling like implantation cramps. During breastfeeding your menstrual cycle ceases to release eggs. A nursing mother doesn’t get period for about 6 months. Later her normal menstrual cycles begin. This is the phenomenon of Lactational Amenorrhea. This is for naturally creating a gap between offsprings. You have a natural contraception during breastfeeding. The reason is the high levels of prolactin hormone suppress all other hormones. Prolactin hormone is responsible for milking. Menopause is the stage when a woman’s menstrual cycle ends forever. This occurs after the age of 40- 45 years. There are a lot of changes during menopause which may feel like pregnancy signs. You feel nausea and cramps may occur during menopause. Perimenopause is the stage before menopause in which the female’s hormones start declining. The signs pregnancy negative pregnancy test may also be because of perimenopause. Certain medications can affect ovulation and in turn your period. Antidepressants and anti-inflammatory drugs can delay ovulation and cause signs pregnancy negative pregnancy test. This is because you will see signs of ovulation and they are much like early pregnancy signs. You might miscalculate it to be pregnancy signs but they are ovulation signs. Mental and physical stress can affect the fertility and cause late ovulation and period. Stress goes as an unidentified cause of infertility. Negative pregnancy test here actually means that you are not pregnant and are making incorrect predictions about being pregnant. If you have cysts in ovaries then you can have cramps and bleeding because of reasons other than pregnancy. Some symptoms of pregnancy overlap with PCOD. Cysts are mass of cells that abnormally go on dividing. You need to get treatment for PCOD. When the tissues of uterus start invading other organs it is Endometriosis. It can cause nausea, bleeding and abnormal discharge. You might consider that you are pregnant, but you actually have a reproductive disorder. 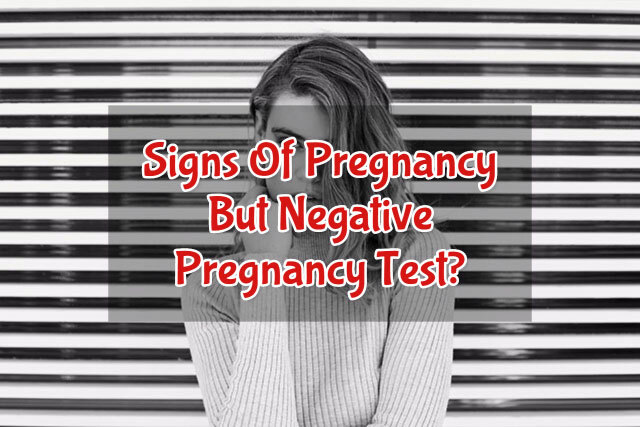 The negative pregnancy test and missed period are signs that something is wrong. Changes in environment can affect ovulation and throw your cycle off rhythm. Exercise or weight fluctuations have a similar effect on period. Eating disorders also affect regular menstrual cycle. When you stop taking contraceptive pills after having them for long periods delay. You will experience nausea, bloating, cramps, and soreness in breasts. Hormones take time to return to normal tuning. In this case, the embryo implants in the tubes and doesn’t move down to the uterus. Placenta formation may not be successful, and hCG levels will be low. Any illness can cause delayed ovulation. What you think as pregnancy symptoms are signs of ovulation. Your period is late because ovulation was late. Some women may take longer to produce enough hCG. The levels double every 48 – 72 hours in case of 85% women, but can take longer. Such women feel the signs pregnancy negative pregnancy test. You could be unknowingly using a box of expired pregnancy tests. The conditions will mimic pregnancy symptoms, but you’ll get a negative pregnancy test. Most commonly known pregnancy symptom is the absence of period flow. Unfortunately, it is not a general rule that late period means you are pregnant. Contrary to the popular belief you could be pregnant and still get your period for first 3 months!! Week late period and negative pregnancy test is not something to worry. 6 days late negative pregnancy test can happen because of the above reasons. You can wait for another two weeks. If you have 3 weeks late period negative pregnancy test, then you need to tell your doctor. A week late period happens all the time and is nothing to panic. It may be just because you had flu. Some pregnancy tests are not sensitive to detect pregnancy at 6 days stage. You can get a pregnancy blood test if you want to. That is the most accurate way of identifying pregnancy. A hospital pregnancy test will sort all confusions, and you will be able to take the right steps further. There are few less known causes of negative pregnancy test even when pregnant. Newly discovered reasons include the high dose and the hook effect. Pseudocyesis and cryptic pregnancy are two more strange causes of a negative pregnancy test in pregnant women. Albeit pseudocyesis is not when a woman is pregnant, she feels pregnant and gets a negative pregnancy test. Other than negative test everything is normal like a pregnancy. Women who have multiples get a negative pregnancy test at an early stage due to high dose effect. Special cases include getting a negative test after a big fat positive pregnancy test. Variant Hook Effect: Advanced research on hCG revealed that the structure of pregnancy hormone changes. During pregnancy, the levels of hCG rise till the end of 12 week pregnancy. Then they gradually start falling until 40 weeks pregnant. If you are too late in pregnancy, you can get negative HPT. Home pregnancy test kits are not suitable for detecting hCG in later phases. The variant hook effect happens when period late for months and negative pregnancy test. High Dose of hCG: If you’re having twins or triplets then your hCG levels rise faster. In this case, the hCG reaching the pregnancy test will flood the detector particles. You won’t get a positive pregnancy test because the test cannot function in the upper limit. Repeated negative pregnancy test in a twin pregnancy is a rare condition but true. After fertility treatments, it is common to witness such pregnancy test malfunctions. Pregnancy Test After IVF: The artificially implanted egg takes a few days to start the natural course. If you take a pregnancy test too early after IVF treatment, you will get a false test. Drugs such as Clomid most commonly used for fertility treatments lengthen your cycle. Naturally, your period will also be late. Consider the day of egg retrieval or insemination as ovulation. Two weeks after the day of receiving the IVF treatment is your due date now. Before that, you’ll be counted as testing early. Previous articleHow To Track Ovulation With Irregular Periods?